The team at Bali-Properties has made it their mission to ensure that you have a truly perfect and unforgettable holiday. They are experienced at accommodating visitors from all over the world to highest international standards. Villa Sungai Tinggi, with 4 King Size Bedrms - Canggu US$ 895 - $ 1,750. One of Bali's very few absolute beachfront Villas. Bounded by rice fields and with over 100m of private beach frontage, it has the ultimate sunset panorama with views over to the Jimbaran Bukit headland. Contempory, tropical, with a refreshing white decor. In upmarket neighbourhood of the exclusive Sentosa villas. Vogue style villa enjoying palm fringed river frontage overlooking paddy fields. 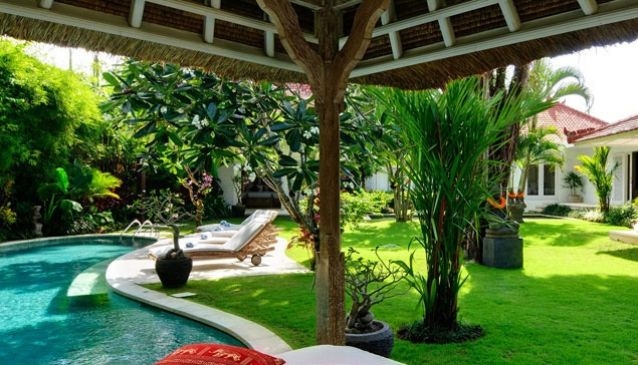 Absolute oceanfront Villa located in Cemagi with access to Mengening Beach, along a winding village road lined with paddyfields and featuring substantial Balinese Temples and massive Banyan Tress.